I love cats! Do you know why? They keep rubbing against you. Though some find this irritating, but I kinda enjoy it! Maybe because my 2nd love language (1st is quality time) is words of affirmation tied with physical touch. Physical touch not only means intimate moments in bed, but can also be expressed in simple physical gestures like holding hands. 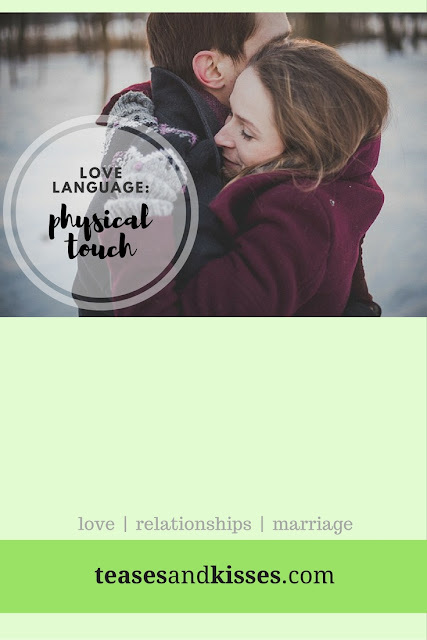 A touch on his hand, your hand on his knees while he is driving, a pat on his shoulder when you pass by his back while he's enjoying his coffee, a hug when he gets home, a few tickles, and a good back massage - these are all things you could do if your partner speaks physical touch. Your arm around her shoulder while walking. Holding hands while driving (plus points if you can show off using a manual car and you can still hold her hand. Hehe) A kiss on the forehead. A kiss on her hand. A hug from the back while she is cooking. And even as a simple 1-2 minute (no distraction) long hug! - these are simple gestures that require not much effort but speaks a thousand love words if your partner speaks physical touch. I love it when my husband holds my hand, or wraps his arm around my shoulder when we walk around, when he hugs me, or touches the back of my head or kisses me. I feel connected to him, physically and emotionally when our skins touch. Sometimes, there's no need for words. Being there physically, the closer the better, the deeper the connection. Though this may also be the challenge for people who are in a long-distance relationship. The person may feel empty, worst, feel unloved. That's why it is very important to know your love languages. If your partner speaks this language, make it a conscious effort to touch him/her every time you are together. do not push away when he reaches out for cuddles. Instead, initiate a tickle fight. it doesn't cost a thing, but it requires you to be together physically. Remember: Physical touch makes you healthier. Studies show that massages, hugs, and hand holding all reduce stress and boost the immune system. So go ahead, give your spouse a hug today! TnK tip: if physical touch is the love language of your partner. Be careful with physical abuse because it will be the most devastating and hurtful thing you can ever do to your partner.